Laurie L. Patton is the 17th president of Middlebury and the first woman to lead the institution in its 218-year history. Patton is a leading authority on South Asian history and culture, and the author or editor of 11 books in these fields. She has also translated the ancient Hindu text, The Bhagavad Gita, for Penguin Classics Series, and is the author of three books of poetry—the most recent book, House Crossing, was published in May 2018. Patton began her career at Bard College, where she was an assistant professor of Asian religions from 1991 to 1996. From 1996 to 2011, Patton served on the faculty and administration at Emory University, where she was the Charles Howard Candler Professor of Religions and the inaugural director of Emory’s Center for Faculty Development and Excellence in the Office of the Provost. While at Emory, Patton served as chair of the Religion Department from 2000 to 2007. Patton then served as the Durden Professor of Religion and Duke University’s Dean of Arts and Sciences until 2015. At Duke, she oversaw 36 academic departments and programs in arts and sciences for the school, which awards 80 percent of Duke’s bachelor degrees. Patton also oversaw Trinity’s $435 million commitment to the “Duke Forward” campaign. At Middlebury, Patton is a strong advocate for building a stronger and more resilient public sphere and fostering increased opportunities for informed discussion and debate about today’s most challenging issues. Early in her leadership, she launched the first institutionwide discussion on Middlebury’s strategic and intellectual direction, Envisioning Middlebury, which was approved by the Board of Trustees in late 2017. 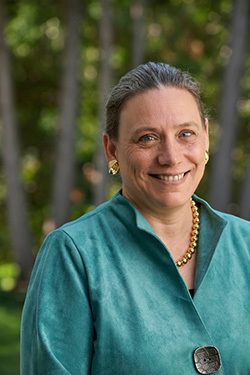 Also in her first years as Middlebury’s president, Patton, along with her team, has initiated numerous programs to strengthen the relationship between the institution’s campuses in Middlebury, Vermont, and Monterey, California. She has raised more than $35 million in financial aid scholarships; inaugurated several new programs focusing on inclusivity on campus; and is guiding Middlebury’s plan to create a new and ambitious environmental goal that will build upon Middlebury’s achievement of carbon neutrality in 2016. From 2008 to 2011, Patton served as president of the American Society for the Study of Religion and in 2018–19, she will be the president of the American Academy of Religion, an 8,000-member scholarly society for the study of religion. In April 2018, she was elected to be a member of the American Academy of Arts & Sciences, as a leader in two fields—religion/philosophy and education. Patton is a native New Englander. She grew up in Danvers, Massachusetts, and graduated from Choate Rosemary Hall in 1979. Patton and her husband, Shalom Goldman, the Pardon Tillinghast Professor of History, Philosophy, and Religion in the Department of Religion at Middlebury College, reside in the President’s House at 3 South Street.